In recent years, India has made significant gains in expanding coverage for maternal, newborn and child health and selected communicable diseases, although the burden of disease from diarrhoea, lower respiratory infections and tuberculosis, as well as neonatal disorders, continues to be very high in some states. Analyses from the recent India State-Level Disease Burden Initiative indicate that the burden due to noncommunicable diseases and injuries overall has overtaken that of communicable, maternal, neonatal and nutritional disorders in all states, albeit at varying rates. As a result, for India as a whole in 2016, an estimated 62% of deaths were due to noncommunicable diseases. The need to reconfigure national public health facilities to match this epidemiological transition was one of the drivers of India’s ambitious Ayushman Bharat initiative. Understandably, much attention has been given to one pillar of Ayushman Bharat, the Pradhan Mantri Jan Arogya Yojana (PMJAY) insurance scheme, covering 40% of the poorest and most vulnerable individuals in the country for secondary and tertiary care. However, less attention has been focused on the second pillar, announced by the Government of India in February 2018, which seeks to transform the existing peripheral health centres to health and wellness centres (HWCs) delivering universal, free comprehensive primary health care (CPHC). The aim of CPHC is to provide a seamless continuum of care that ensures the principles of equity, quality, universality and no financial hardship. The announcement was made in the context of the annual budget presentation, assigning financial resources to the National Health Policy 2017, which commits two thirds of the budget to primary health care, and explicitly mandates a move from peripheral centres providing selective primary health care to 150 000 HWCs acting as the first point of contact for an expanded set of health-care services closer to the community (see [Box 1]). The need to expand and upgrade the primary health-care services provided was underscored by the National Sample Survey for 2014, which showed that only 11.5% of people in rural areas and 3.9% in urban areas accessed this vast network of peripheral public health facilities for health-care needs other than childbirth. The existing facilities targeted for upgrading to HWCs comprise (i) sub-health centres (SHCs), which cover a population of 5000 (or 3000 in geographically difficult areas), staffed by one or two multipurpose workers, instead of auxiliary nurse midwives (ANMs), largely delivering maternal and child health services; and (ii) primary health centres (PHCs), covering a population of 30 000 (or 20 000 in difficult areas), staffed by one or two medical officers, a nurse, a pharmacist and a laboratory technician. Currently, both SHCs and PHCs provide a limited package of services for reproductive and child health and communicable diseases. PHCs are expected to serve as the first point of referral for SHCs. HWCs at both levels are expected to provide primary health care – largely ambulatory – and public health services to the populations in their jurisdiction, and serve a gatekeeping function to medical officers or specialists at secondary facilities at the community health centre or district hospital. The first HWC was inaugurated in April 2018, and completion of roll-out across India is planned for the end of 2022. Making the HWCs fit for purpose to deliver high-quality CPHC requires a paradigm shift at many levels. This article focuses on four shifts that are likely to have an impact on efficiency, equity and quality. The first, and perhaps the most significant, is innovation in human resources. Services at the HWC at the most peripheral level, namely the SHC, will be delivered through a team, led by a new cadre of non-physician health worker, a mid-level health provider, supported by one or two multipurpose workers, and ASHAs – as India’s community health workers are called. Similar team-based models of community care in Brazil, and early work in South Africa, have shown promise. The mid-level health provider is either a nurse or an ayurvedic practitioner, trained in a 6 month Certificate Programme in Community Health and accredited for primary health care and public health competencies. India also has over 500 000 village health, sanitation and nutrition committees that will be leveraged for prevention and promotion efforts. The HWC team is expected to ensure coordinated care, including support to the community for navigating two-way referrals. The latter is important, particularly as it enables home- and community-based care for those using the PMJAY insurance programme. Provision of expanded services offered by HWCs is also intended to ease the burden on secondary and tertiary facilities. The second shift is the dispensation of free medicines for chronic care, at the HWC, to avoid patient hardship, reduce out-of-pocket expenses and enable improvement in treatment adherence. Early results from the field demonstrate that this single measure has had positive outcomes. This is particularly the case in states with robust procurement and logistics systems for medicines and supplies. The third shift relates to financial reforms, including capitation-based payments to HWCs and performance-linked payments to the mid-level health provider and to the team of front-line workers. The salary of the mid-level health provider is blended – consisting of a fixed component and an incentive component linked to key outcomes, which are measured using monitoring data captured through an IT system. The fourth shift uses digital technology and information and communications technology (ICT) platforms to ensure continuity of care through universal population empanelment and registration to a particular HWC, enabling, inter alia, treatment adherence and tracking of referrals, facilitating performance payments and ensuring continuity of care. The design of HWCs and the delivery of services builds on the experiences of India’s flagship programme for strengthening health systems, the National Health Mission. Most components in the design of HWCs leverage the investments in and implementation structures of the National Health Mission. Significantly, these include: (i) the ASHA and people’s participation through community collectives; (ii) the use of digital technology for tracking mothers and children for expanded coverage; (iii) using outreach to enable universal coverage for antenatal, postnatal, immunization and family planning services, including mobile units to expand coverage; (iv) instituting quality standards and ensuring use of treatment protocols; (v) supplying free medicines and increasing access to free diagnostics; (vi) creating systems for emergency referral and transport; and (vii) strengthening secondary care services. Increasing the scope of these components to address the expanded service delivery package will require reorganization of work processes, including addressing the continuum of care across facility levels – moving from episodic pregnancy and delivery, newborn and immunization services to chronic care services; instituting screening and early treatment programmes; ensuring high-quality clinical services; and using ICT for better reporting, focusing on health promotion and addressing health literacy in communities. The HWCs are intended to increase the focus on wellness and lifestyle modification, particularly related to chronic diseases. India has a mature community health worker programme and community structures cutting across sectors that could prove to be effective in mounting community-led health-promotion measures. Strategies for effective engagement and measurement need to be developed to enable successful implementation. There are also multiple understandings of the composition and organization of primary health care among policy-makers and practitioners. Decades of implementing a primary health-care package for maternal and child health has narrowed the perspectives of implementers. Competing demands for attention to the emergent need for comprehensive services, especially chronic care in areas where maternal and infant mortality are high, require re-engineering of several work processes, from community to facility levels, among programme managers and service providers. Reconciliation of these views is important, for a successful move towards realizing the commitments of the Declaration of Alma-Ata, reinforced in the recent Declaration of Astana. As in all interventions, in a large federally structured country such as India, translation of the essential contours of a centrally funded programme into the institutional mandates and implementation processes of diverse state, district and subdistrict contexts requires consensus, joint learning efforts, sharing of lessons and drawing from successes. There is also some concern about organizational inefficiencies, a mismatch between resources and expectations, and a lack of preparedness. However, it is important to capitalize on the current high level of political commitment accorded to comprehensive primary health care, in conjunction with addressing concerns. 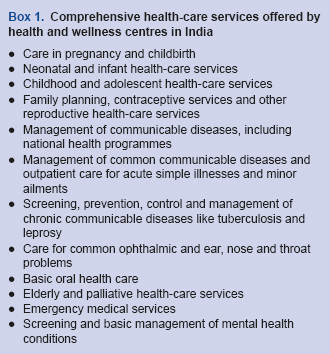 We are entering uncharted territory for several of these components but, given a well-articulated design, derived through consensus, and building on selected existing institutional and implementation platforms and structures, it is urgent for India to move forward with implementation and demonstrate the critical role of primary health care in achieving universal health coverage. Conflict of interest: RRV is Executive Director at the National Health Systems Resource Centre; the views expressed in this paper are those of the author and do not necessarily reflect the views of the organization. Authorship: RRV was responsible for the overall conception, drafting and revision of the paper. GG and SS provided technical inputs. India State-Level Disease Burden Initiative Collaborators. Nations within a nation: variations in epidemiological transition across the states of India, 1990–2016 in the Global Burden of Disease Study. Lancet. 2017;390:2437–60. doi:10.1016/S0140-6736(17)32804-0. Ministry of Finance. Ayushman Bharat for a new India – 2022, announced. Two major initiatives in health sector announced. Rs. 1200 Crore allocated for 1.5 Lakh health and wellness centres. National health protection scheme to provide hospitalisation cover to over 10 crore poor and vulnerable families. 1 February 2018 (http://www.pib.gov.in/PressReleaseIframePage.aspx?PRID=1518544, accessed 14 January 2019). National Health Policy 2017. New Delhi: Ministry of Health and Family Welfare, Government of India; 2017 (http://164.100.158.44/showfile.php?lid=4275, accessed 14 January 2019). Key indicators of social consumption in India: health. NSS 71st round. January – June 2014. New Delhi: Government of India, Ministry of Statistics and Programme Implementation; 2015 (http://mail.mospi.gov.in/index.php/catalog/161/download/1949, accessed 14 January 2019). Center for Global Development. Millions saved. Brazil’s Programa Saúde da Família (http://millionssaved.cgdev.org/case-studies/brazils-programa-saude-da-familia, accessed 14 January 2019). Assegaai T, Reagon G, Schneider H. Evaluating the effect of ward-based outreach teams on primary healthcare performance in North West Province, South Africa: a plausibility design using routine data. S Afr Med J. 2018;108(4):329–35. doi:10.7196/SAMJ.2018.v108i4.12755. Muraleedharan VR, Dash U, Vaishnavi SV, Rajesh M, Gopinath R, Hariharan M et al. Universal health coverage-pilot in Tamil Nadu: has it delivered what was expected? Chennai: Centre for Technology and Policy, Department of Humanities and Social Sciences, IIT Madras; 2018 (http://www.nrhmtn.gov.in/adv/UHC%20Pilot%20Report_Tamilnadu_IITM_24Feb2018.pdf, accessed 14 January 2019). Ayushman Bharat. Comprehensive primary health care through health and wellness centers. Operational guidelines. New Delhi: Ministry of Health and Family Welfare, Government of India; 2018 (https://gujhealth.gujarat.gov.in/images/pdf/4-Guideline-101018.pdf, accessed 14 January 2019). NRHM in the Eleventh Five Year Plan (2007–2012). Strengthening public health systems. New Delhi: National Health Systems Resource Centre; 2012 (http://nhsrcindia.org/sites/default/files/NRHM%20in%2011th%20five%20year%20plan.pdf, accessed 14 January 2019). Declaration of Alma-Ata. International Conference on Primary Health Care, Alma-Ata, USSR, 6–12 September 1978 (https://www.who.int/publications/almaata_declaration_en.pdf?ua=1, accessed 7 January 2019). Declaration of Astana. Global Conference on Primary Health Care. Astana, Kazakhstan, 25–26 October 2018 (https://www.who.int/docs/default-source/primary-health/declaration/gcphc-declaration.pdf, accessed 14 January 2019).